There's no reason to restrict the many health benefits of coffee to your morning mug. 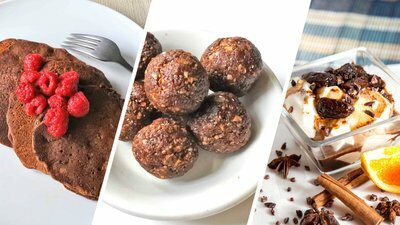 Try one of these coffee-infused recipes today to kick up your meal! For millions of sleep-deprived people, mornings would be a blur if not for the stimulating power of coffee. Athletes have long known that a cup of joe can help power up workouts, and research shows that coffee has some health-supporting potential, too. Research published in the journal Circulation reported that drinking 1-3 cups of coffee a day was associated with supporting cardiovascular health when compared to drinking no coffee. Even more benefit may be associated with drinking 3-5 cups a day! Even decaffeinated coffee has been shown to be ticker-friendly. Why? Coffee, which hails from the seed of a fruit, contains a smorgasbord of healthy plant compounds that have antioxidant powers. These nutrients may work together to help promote cardiovascular and overall health. So, when something is so awesome, why would you want to pigeonhole it to a mere drink? Indeed, the intense flavor of coffee can be used to gussy up a range of recipes. These three coffee-infused bites prove it's time to get your grind on. Say hello to the most awesome yogurt topping ever. Figs add natural sweetness, whereas the highly flavored coffee syrup is a total taste bud party. You can also use the sauce on cottage cheese, oatmeal, and ice cream. If preferred, dried plums can be used in replace of dried figs. Better-body bonus: Parched figs are more than just carbohydrates. They also supply hunger-fighting fiber, providing 2 grams per fig! Pancakes that are little more than a stack of white flour topped with faux maple syrup are a total buzzkill. Fortunately, these much healthier, java-infused flapjacks provide a surefire way to rev up your morning. And for harried mornings, the batter can be made the night before and chilled. Whole-wheat pastry flour or spelt flour can be substituted for oat flour. Better-body bonus: Made simply by grinding up oats into a fine powder, oat flour has a denser supply of fiber, vitamins, and minerals than your typical all-purpose flour. Sneaking in some protein powder and chopped nuts assures that these pancakes stick with you longer to avoid morning snack attacks. To wake up your workouts, try popping a couple espresso energy balls rather than your usual pre-workout. You can even use them as a go-to snack choice, replacing the nutritional landmines that populate most vending machines. For higher-protein energy balls, try blending in a scoop of your favorite protein powder. Store balls in the refrigerator for up to 10 days. Better-body bonus: According to research published in the New England Journal of Medicine, people who incorporate nuts into their daily diet may help support the health of their heart and respiratory system when compared to individuals who don't eat nuts daily. It's likely a synergy of vitamins, minerals, fiber, antioxidants, and unsaturated fats that makes nuts beneficial. And don't worry about an increase in weight gain with an increase in nut consumption. Researchers also observed that an increase in nut consumption was associated with less weight gain. Ding, M., Satija, A., Bhupathiraju, S. N., Hu, Y., Sun, Q., Han, J., ... & Hu, F. B. (2015). Association of coffee consumption with total and cause-specific mortality in three large prospective cohorts. Circulation, CIRCULATIONAHA-115. Bao, Y., Han, J., Hu, F. B., Giovannucci, E. L., Stampfer, M. J., Willett, W. C., & Fuchs, C. S. (2013). Association of nut consumption with total and cause-specific mortality. New England Journal of Medicine, 369(21), 2001-2011.